I have an Arduino project where I'd like to control a stepper motor. 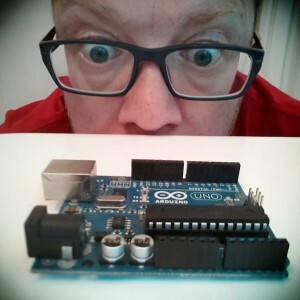 Unfortunately, the Arduino library for stepper motors is very limited. I'd like to define parameters for the acceleration, deceleration, and total displacement and have the Arduino take care of the rest. Poking around on this forum, I surprised that no one seems to have posted anything relating to this - so I figured it was incumbent on me to get something started. I've attached my first iteration. Seems to be working well in my tests. Comments and suggestions will be greatly appreciated. In my current setup, I'm using the EasyDriver stepper driver from sparkfun Electronics - though any driver that used pulse and direction should work fine. Thanks for this. I also have the Easydriver v3. Though I have so far only played around with the sample code in the playground. What is the reason for you needing finer control over the acceleration and deceleration? Making a telescope mount? The point about acceleration is that you can get the motor to run at a faster top speed if you accelerate up to it than you can if you try and drive it from a standing start. The latter is sometimes called the stall speed. It is due to the mechanical inertia you have. However, if you get it accelerating too fast then you start skipping steps and so you loose accuracy. I used to use a liner ramp to get up to speed but you really should use a bit of control theory to work out the acceleration profile. Same goes for slowing down, if you just do a dead stop it can over run if going too fast. Chris thanks for posting this it should be useful. Thanks. That will explain why my telescope mount starts slowly, speeds up, runs at its full slew speed, then decelerates to a stop gradually. Did this project go anywhere? I'm thinking about replacing my old telescope controller and motors and I'd have more fun replacing it with an arduino setup. I've thought about making a whole mount from scratch using an Arduino, but it will no doubt be one of those projects I keep saying 'I must do that one day'. I use the ED too to drive a 2axis panorama head and use a very simple approach: start slow and accelerate until the max and slow down again - done over the range of steps I want to go. It gives a smooth movement and I don't need consider extra time to stabilize the mount before I release the cams shutter. absolutum could you show me your code? :-/ i'm trying to do something like that! Thanks for the code at top of this site! I will improve the stepper library a little bit to include acceleration and deceleration and also allow a higher max. velocity. At the moment only 300rmp possible at a stepper with 200 steps because using delay() . The name of the new library will be "StepperHQ". I just start a telescope controlling project. If some of yours have a similar project I interresting ! Why would it not be t12 = (Pt/(Vm/1e6))-(ta+td) ?